Our water based activities not only bring a visual element to the energy being created, they also demonstrate how the energy can be transferred to another object. Whether its pushing water from one level to another or powering a power washer, you know there is going to be a lot of fun when water is involved. 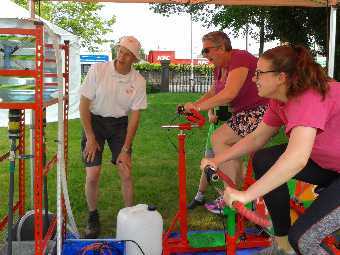 Two challengers go head to head to pump tanks from our storage tank to the water bottles at the top of the frame using our PeachyKeen Power Stations. 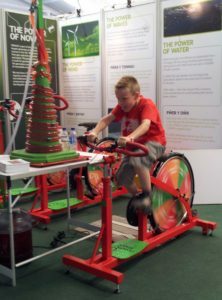 Originally developed for South Wales Electricity Board, now part of SSE, when they attended the Royal Welsh Agricultural Show. 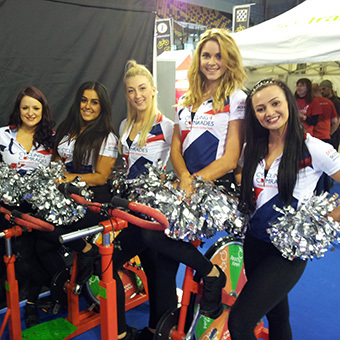 Our solution enabled fans to compete against Welsh Rugby Grand Slam Winner, Ken Owens. Vortices can be found in nature in many forms: tornadoes, whirlpools, weather systems, even galaxies – here is the PeachyKeen version. Water stored in the lower tank is propelled upwards in a vortex fashion and subsides again with the burbling sound of an Icelandic geyser. PeachyKeen powered of course with one of our energy creating pedal devices and it also glows in the dark…!!! An ideal activity for science related events, sport challenges or simply to appreciate the wonders of nature. 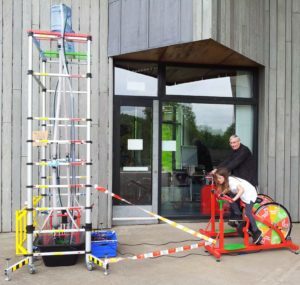 A popular and fun activity for children – using our PeachyKeen bikes, the participant must cycle as fast as they can to push the water to the top of the helter skelter! Of course, as with many of our activities, this has the added bonus of making turning into a competition for the fastest time! But the question is – what makes the liquid red? A fantastic fun-filled two player activity which is designed to use human energy to clean bikes but inevitably ends up messy (and wet). 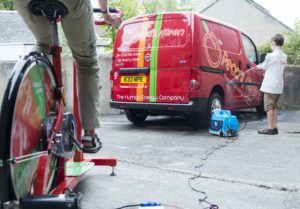 One participant uses pedal power using our PeachyKeen pods to provide the energy to power the washer while another participant directs the jets to wash a bike or a vehicle. Alternatively the power washer can be used to knock down targets such as skittles. Two participants pedal the bikes to power water pumps that pump water from the bottom of a large tank to smaller tanks 3 metres up in the cage. Once the top tanks are full the participants can stop pedalling and watch the water being released back down to propel a water turbine that in turn spins up a generator that provides power to illuminate an LED sign and a laser. Due to the popularity of our original Water Tower, PeachyKeen decided to make a portable version that would enable ease of transport and assembly while still retaining functionality and fun of the full version.